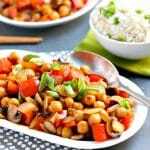 Chickpea Stir Fry is quick to make with simple ingredients. 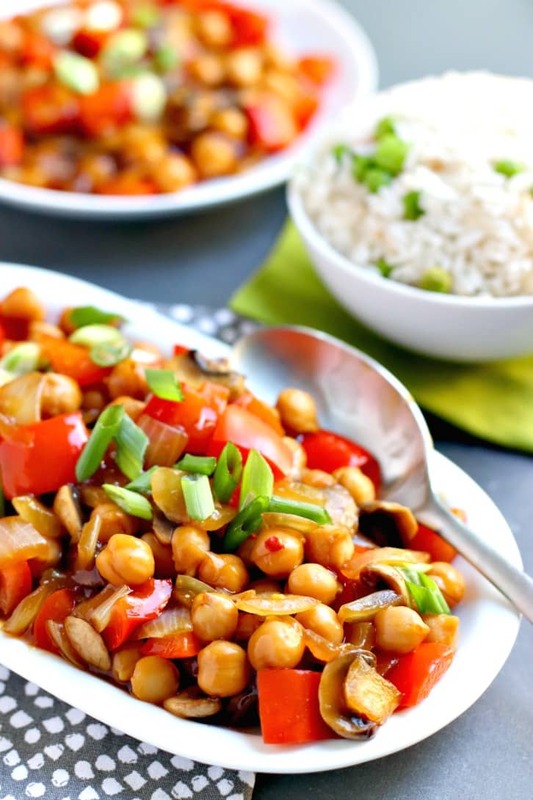 This Chinese-influenced recipe is vegan, gluten-free, oil-free, and soy-free. It’s the perfect plant-based alternative for those who don’t like tofu. I absolutely love stir fry. In fact, I eat it once or twice every week. It’s so easy to make with whatever vegetables you have on hand. And it takes very little time, so it’s perfect for weeknights. I usually make dishes with tofu, such as Orange Tofu or Peanut Sauce Tofu. But recently I started experimenting with chickpeas (garbanzo beans) in place of tofu. While I really love tofu, I realize that not everyone does. And sometimes I run out of tofu and don’t feel like going to the supermarket. Or maybe I feel like having something a little different. And that’s how new recipes like Chickpea Stir Fry are created! Before we get to the recipe, I want to share a little about this book that I think you will really enjoy. If you’ve ever wondered where classic dishes came from or how chefs come up with new recipes, Kitchen Creativity is the book for you. 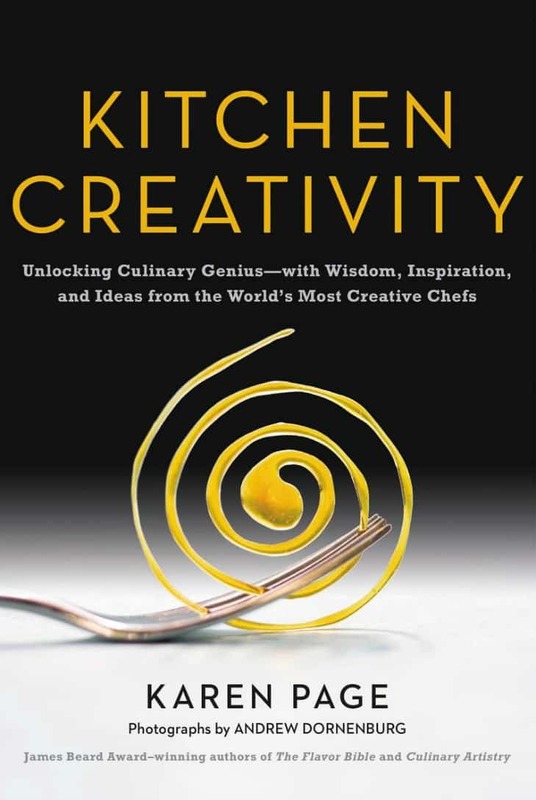 Kitchen Creativity: Unlocking Culinary Genius–with Wisdom, Inspiration, and Ideas from the World’s Most Creative Chefs by Karen Page is a fascinating read. Whether you want to learn more about technique, flavors, or cooking without relying on recipes, this is the book for you. Even if you don’t enjoy cooking, but love food, I think you’ll find this book very entertaining. It’s like watching Top Chef or Chopped, but having a deeper understanding of how the chefs think and come up with ideas. Karen Page’s previous book The Vegetarian Flavor Bible is one I often turn to when I need to get my creative juices flowing. Kitchen Creativity has some elements of that book with lists to inspire you, but it’s so much more than that. I’ve been keeping it on my nightstand and reading little segments of it every night. It’s so fun to read excerpts from famous celebrity chefs and learn tips for becoming more creative in the kitchen. 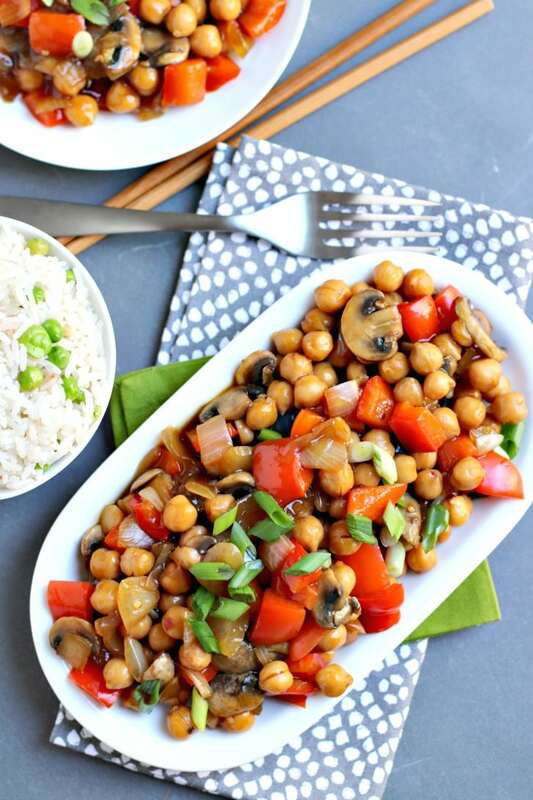 Making Chickpea Stir Fry is very simple. And it’s a really nutritious dish, thanks in part to the mighty garbanzo bean. Did you know that chickpeas are a great source of protein, carbohydrates, and fiber? You can learn more about the health benefits of this legume in the article What are the benefits of chickpeas? from Medical News Today. I like to serve this dish with Coconut Jasmine Rice on the side. Or you could eat it with brown rice or quinoa. Making this recipe is easy. First I marinate the chickpeas in a little tamari for added flavor. You can skip this step if you are watching your sodium levels. Next I mix together the ingredients for the sauce and set it aside. Then I stir fry the vegetables in a few tablespoons of water. I use red bell pepper, onion, and mushrooms, but you can use your favorites. Finally I add in the chickpeas and sauce and stir until everything is hot and the sauce has thickened. Dinner is ready in under 30 minutes! Now let’s make Chickpea Stir Fry! 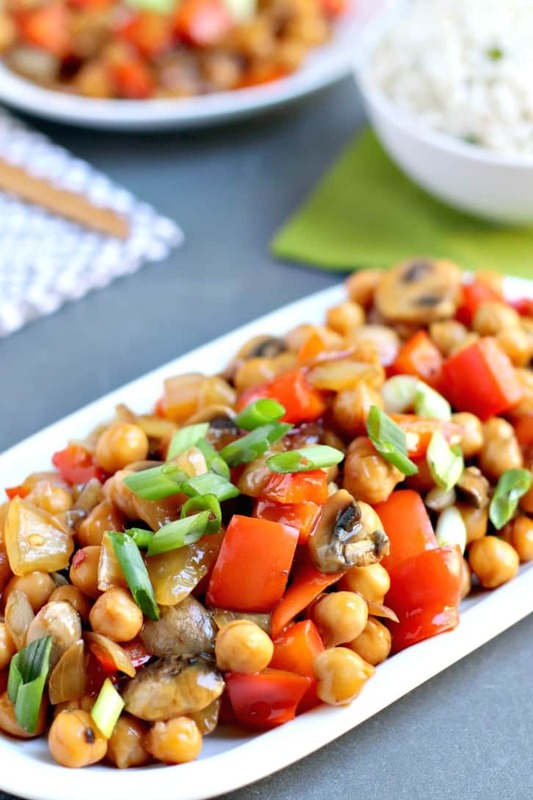 Chickpea Stir Fry comes together in minutes with simple ingredients. It's vegan, gluten-free, and oil-free, and perfect for those who don't like tofu. I use onion, red bell pepper, and mushrooms in this recipe, but feel free to use your favorite vegetables. 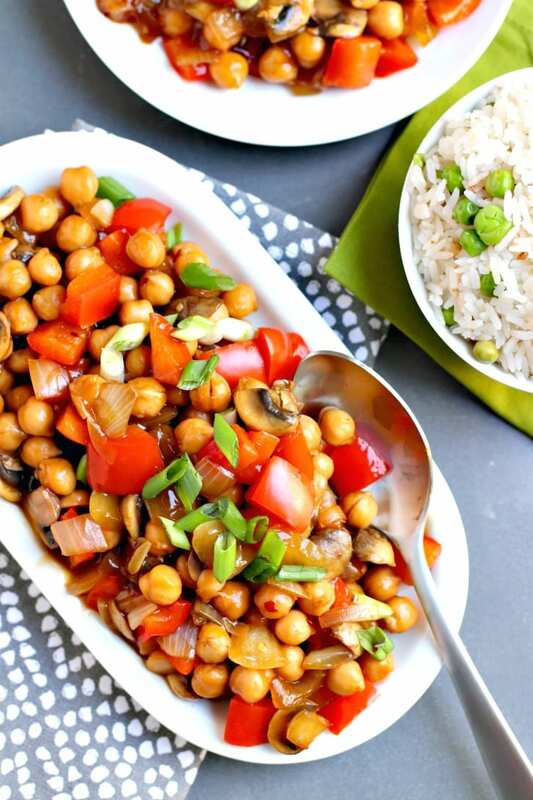 Marinate the chickpeas in the tablespoon of tamari for 15 minutes. Set aside. Heat a non-stick skillet over medium heat. Add about 2 tablespoons water. Add the onion and red bell pepper and stir fry a few minutes until the onion is slightly translucent. Next add the mushrooms to the skillet and stir fry for a couple more minutes. Add the chickpeas and stir fry until they are heated through. Give the sauce a good stir, then add it to the skillet. Stir until the sauce has thickened and the chickpeas and vegetables are well coated. Garnish with sliced green onion, if desired. Serve with Coconut Jasmine Rice or your favorite grain. Leftovers will keep refrigerated for several days and can be reheated on the stove or in a microwave. Great recipe! It has the flavors of a Chinese ginger and garlic dish, without all of the extra fat you’d get from takeout. I found it was a bit too much ginger for me, so I added 1 1/2 tsp of honey to temper the spice. I think next time I’ll add broccoli and more veggies. But overall it was a yummy dish I’ll add to my repertoire. 😋 Thank you! So glad you enjoyed it, Melissa! Thanks for the feedback.